Remember that moment when you got your diploma? And then after some time you’ve landed to your dream job and after having been given proper training, chance and right timing, you got that much-coveted position in your workplace. Because of your hard work, you were able to have good credit, steady income, and savings. Congratulations! You’re likely to be in a secured position to seriously consider buying your own house. 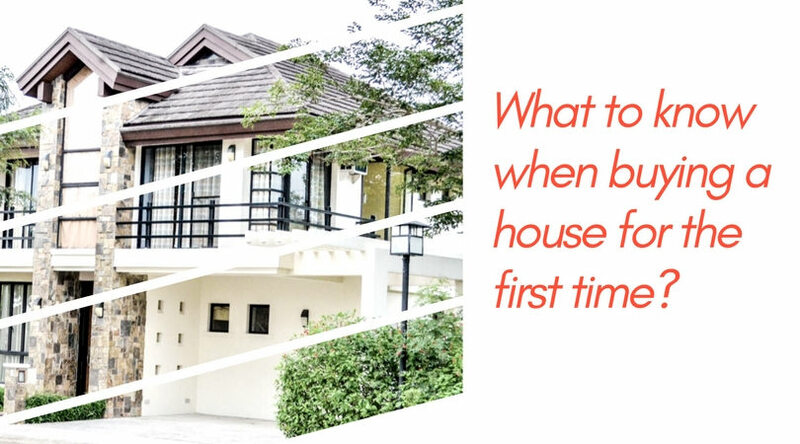 That is the thought that keeps buzzing in your mind as you search the internet about what first time home buyers should know when buying a house. Below is a checklist that will give you some helpful insights that you might consider as you plan on purchasing your own home. Bungalow – a one-story house that is often small in size. Condominium/Condo – a residential building with several units. Each unit can be owned by an individual. Duplex – Two houses built on the same roof and less expensive than single detached homes. Suited for newlywed couples who are just starting their own family. Single detached – Have a large front and back area, no shared walls or floors, have a garage, attic, basement space, and more floor area and is best for large/growing families. Single attached – May have space in front and back but one side of the house is attached or built directly at the boundary of the lot. Row House (townhome/townhouse) – Identical and clustered houses in a row sharing the same wall. Unlike renting which requires upfront financial investment, purchasing a house gives you the chance to choose whether to purchase your chosen home type in cash or take the installment option instead. You might also take into consideration knowing whether or not you are qualified for a housing loan. You know you are already prepared for something when your plans are matched by the number of resources you need. If you are already decided to buy the property and have chosen the installment option you prefer, you will be required to give a down payment. On the other hand, you might find and be able to qualify for some loan grants that do not require any money down. In making any decision, it is better to observe and think critically by searching for dependable and credible sources before deciding to buy a house. Since you are willing to place a good amount of money in buying your new home, you need to be well equipped to the cost and benefits of buying a house so that your time, effort and finances are used efficiently. You might consider talking with a friend who recently searched or bought a house and ask about his/her experience and opinion on what is best and worst that can happen while looking for and buying a new house. Another option is you might choose to contact and to communicate with a real estate broker, whom with much experience in buying and selling houses, may guide you all the way from looking to the type of house you need up to the time when you’ve finally decided to close the deal. You might also consider utilizing the use of internet technology by finding a helpful and trusted real estate website where you can read about buying houses through blogs or articles. The date of viewing is your chance to see and observe the type of house you want and need. Of course, this is done on your most convenient time. I would suggest that you should try to view not only one house but take your time to examine different houses. You should take into consideration some factors like the location of the house, size of each room, style, exterior and interior design of the house, etc. Scrutinize it and see if it fits your needs. Also, observe the kind of neighborhood the location has because it is important as well. When everything is set and you have already found the best deal for you, you are now free to plan when to move into your new house. Make sure that the receipt of payment and copies of documents where all your records encoded are with you and you have paid and cleared up all possible holds you have to fix. Now, let us talk about the buying process in a nutshell. Do not buy something that is way above and beyond your means. Financial capacity of each buyer is highly considered by each seller because they want to maximize profits. If a certain buyer does not have enough money to buy a house in cash, there are installment options to choose from depending on the real estate developer they have chosen. You might need to educate yourself about some terms used in the business-like amortization, mortgage, etc. that may be unfamiliar to some. After giving time in assessing your financial capacity, you should create a checklist for you to have the firm destination to follow. Think about the location of the house you want to live, number of rooms you want for your family, the kind of neighborhood you want to live with and all other factors that will come into your mind when you think of living a life you wanted. The danger of not having a checklist is that there are lots of varieties of houses to choose from and you might get overwhelmed and confused if you do not have a checklist of your requirements in a property. Doing so will save you time and energy and your choices will be narrowed down to what you really want to have. Assuming that you already have your checklist prepared, you can now start searching for the home you want. You may browse the internet where you can find a lot of real estate developers and brokers to talk with. You can look for advertisements on TV, bulletin boards, billboards, radio, newspaper, or from a friend who recently purchased a house. Tripping. It is the act of viewing the house you have chosen with the help of a broker or seller. You can schedule it at your most convenient time and you are entitled to maximize it to your your benefit. Do not be afraid to ask questions to your broker about the houses you have seen and observed during the visit. Like any other deals, buying a house should be formal and documented whether paid in cash or installment. You should list and discuss the documents with the seller and clear up all possible holds. Congratulations on getting your new home! You are now ready to move in.